As a custom manufacturer, Make An Impression provides design, marketing and print of all quantities and complexities. Beyond business cards and stationery, we offer project planning, fulfillment and mailing services. Sharing our knowledge and expertise, benefits individuals, small business as well as large corporations. If you are looking for an exciting career with a dynamic company, we are the company for you. 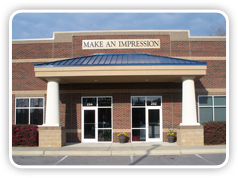 Backed with over 40 years of experience, Make An Impression continues to offer quality products and services on time for the past 15 years. Continued growth requires growth oriented employees. Make An Impression is looking for new members of our team to learn and retain information in an ever changing environment. Each of our team wears different hats as needed. Willingness to go the extra mile is required. Understanding of accounting practices and principles. We would like to dedicate our time to a conversation with you, as such we request you do not call the office unless we have requested you to do so.